In 2041, the United States goes to war with China in Hardy’s (The Place Where the Giant Fell, 2016, etc.) action-packed novel. President Constance Higgins is in a quandary. After a socialist presidential administration, the country is $32 trillion in debt, so the government is forced to seek financial aid from foreign nations. China demands repayment of its debt in gold, but Higgins refuses. Meanwhile, U.S. intelligence operatives intercept a strange transmission that mentions something called “Operation Dragon.” At a summit, China and other powerful nations inform Higgins that all the country’s debts will be cleared–if she gives them ownership of land in California that will enable them to take control of the world’s oil supply. Soon, further chaos and war erupts. Another plot line involves brothers Mike and Sean Dalton, the sons of President Higgins’ best friend, Maria. Mike puts Sean in the hospital in retaliation for upsetting his girlfriend, Kyla MacGregor, but then Sean escapes and disappears. Later, Kyla is drugged, raped, and impregnated by an intruder while Mike, a U.S. Army lieutenant, is away at war. As he fights for his own survival, he realizes that Sean’s whereabouts might be closer than he assumed. This novel effectively encapsulates the difficulty of wartime, both for those on the front line and for the decision-makers in the government. Specifically, Hardy depicts the emotional bonds between people in crisis; for example, President Higgins and Secretary of Defense John Mahood are shown to be able to work together, despite their differing opinions. An intense, sometimes-disturbing story about a disastrous American future. Secretary of Defense John Mahood feels that money is not what this is actually about. He believes there is something far worse going on. As the only one offering a helpful suggestion, he tells the President that since Zhang Li has given them ninety days to comply, they should not do so. If at that time the Chinese do not go forward with their threats about gold versus paper, then they have revealed something far worse is actually up their sleeves. Mahood is right in his assumption. What is being planned is a scheme of monumental proportions called Operation Dragon, where the U.S. will have to face another battle. Back in the ‘real world,’ Mike Dalton is the perfect male specimen. Not only is this guy a heartthrob for all the young ladies who call the Columbia University, NY, campus home, but he also just won the NCAA championship with his winning basket. Sean, Mike’s younger brother, also loves his sibling but is envious of the attention he receives. Worse, he hates Mike for his relationship with Kyla MacGregor. A girl from Scotland, she is pre-med, highly intelligent, and equally as stunning as Mike. 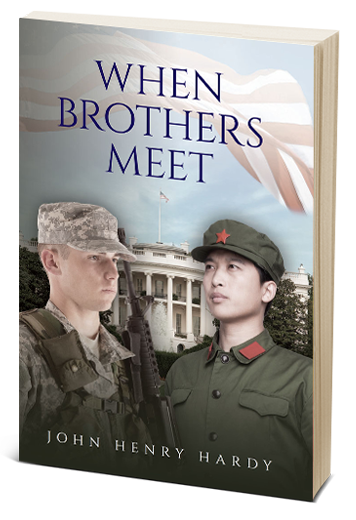 When a family fight ensues that leaves the “golden” son to graduate top of his class and head into the U.S. military, the feeling of guilt at what happened with his brother goes with him. So what does a patriot of the U.S. who has had an argument with his brother have to do with the Chinese military moving into the U.S.? And who is NSA Agent Jim Hawkins, and what does he uncover about the Chinese government under a table through a trap door inside a restaurant in Chinatown? These answers cannot be given here, but you will simply note that this is one fast-paced, powerful story with questions galore. The author has done a wonderful job keeping the thrills happening while telling the tale of brothers who are on an emotional path that may make going to war look like a walk in the park. Quill says: Readers who love everything from history to war to family sagas that hit you directly in the heart, will find that this book answers each and every call. Flowed and transitioned flawlessly like butter. Very good read. I didn’t expect the ending to finish the way that it did. Entertaining, enlightening…I thoroughly enjoyed it. Professionally done and it flowed flawlessly. Great book! This was a very good, intense story! It caught my attention right away with the lady president and all her cabinet, and the amazing and tense stuff going on in the country. I could easily see a lot that happened in the book happening in real life. The illegal aliens being a drain on the country economically, and the other countries trying to take over. It’s a uniquely personal story, also, with the two brothers, Mike and Sean, and their lifelong competition. I felt like this story was so real to life and all the possibilities and heartbreaks. I enjoyed the book, and highly recommend it. You will have a hard time stopping to do anything else, and will be on a roller coaster of emotions as the story gets very suspenseful and comes to the end. I was captivated by this book. I couldn’t put it down and read chapter after chapter devouring the story. I felt like the author did a wonderful job with plot and storyline. He was able to make the story really authentic and believable. John Henry Hardy did a splendid job with character development and backstory. I loved and worried about how authentic and close to reality this book hits. This story was something that could easily come to fruition within my lifetime. While I appreciate how well the author did, it is truly terrifying to think of the precarious position our country is in currently.